How to Stream Android Video Music to PC? With AirPlay, iOS handsets can be streamed to PC or Apple TV. 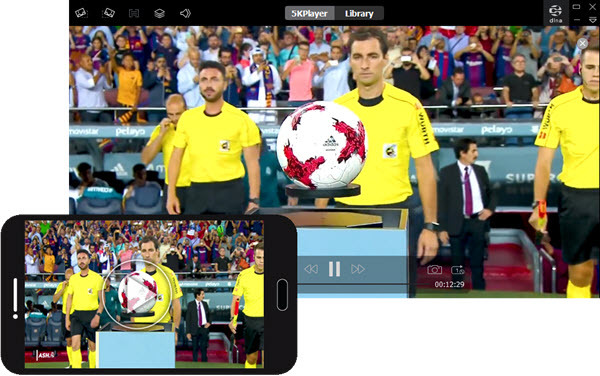 How about Android to PC stream? Good news is that there is also a protocol similar to AirPlay called DLNA that can help stream Android to PC wirelessly and without any payment. This article is focusing on how to stream Android to computer via DLNA, hope it is helpful. DearMob's 5KPlayer is a desktop DLNA media receiver and player that can handle videos music in any format streamed from Android phones or other DLNA-compatible devices, and also DLNA streaming PC to TV wirelessly without hassle. DLNA as of now has been built into most of the DLNA Android phones, so that streaming video music through DLNA server on Android would not be a problem. Even if your Android or iPhone handset is not DLNA-compatible natively, you can still make use of the DLNA-compliant apps to stream phone to PC. As your Android phone has got ready to stream video music to PC through DLNA, the only issue left is how to make PC receive and play DLNA streaming. The solution is to turn your PC into a DLNA-supported device and 5KPlayer can help that. 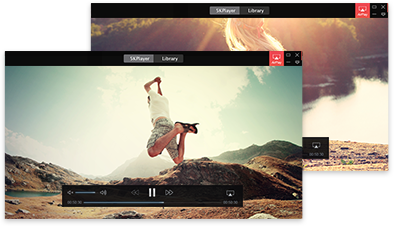 First being an AirPlay server, 5KPlayer always upholds the original intention to help people enjoy multimedia easily with fun entertainment. And promoting watching movies and videos wirelessly on a bigger screen is 5KPlayer's prior task, so it adds DLNA streaming recently to itself to help you turn computer into a DLNA client to stream Android to PC like what Apple users do with AirPlay. As a three-in-one DLNA streaming software, 5KPlayer acts as a DLNA player to display what you stream from Android to computer, DLNA sender to DLNA stream videos music on computer to DLNA-enabled TV, and also a DLNA media server to provide numerous media resources by downloading online for you to access on DLNA-supported Android, iPhone and smart TV. How to Stream Android Video Music to PC via 5KPlayer? Preparations: Both the media sender and receiver should be DLNA-compatible, so BubbleUPnP, AllCast, Media House UPnP, etc DLNA apps are suggested to help your Android stream video music to computer. Also, free download this UPnP player - 5KPlayer to enable PC to receive DLNA streaming media files. Step 1. Guess you have installed DLNA app on Android and 5KPlayer on PC, now connect your Android phone and PC to the same network. Step 2. Click on Library on the main UI of 5KPlayer, and then click on DLNA Streamer on the left bar to check if 5KPlayer has discovered your Android device. Step 3. Launch DLNA app on your Android device and play video music on your Android phone, DLNA app will help stream your Android video music to PC and then 5KPlayer will receive the streaming and play it instantly. Windows Media Player is by default the DLNA certified player pre-installed on Windows PC to play what stream from Android to PC, but the flaw is that it is limited in supported formats. So, we suggest you 5KPlayer to stream Android phone to PC or stream PC to Xbox or stream PC to Samsung Smart TV guide to enjoy the AirPlay-like experience. Best DLNA app for iPhone powers your iOS iPhone to be DLNA-supported to stream media to vast number of devices wirelessly.